Nikolai Krymov is a Russian landscape painter, an ardent admirer of Levitan’s works. Parents soon discovered the talent of the eldest son and in time supported him in his visual endeavors. Krymov lived a long, full of creative success, life. He was never interested in traveling and was not attracted by the romance of the roads, he lived in Russia and was proud of it. Krymov received recognition very early, he was appreciated at the exhibition when he was only 22 years old, since then he has not ceased to create canvases filled with subtle content and precise solution of light and shadow. The artist believed that nature around and just the surrounding space is a sphere of aesthetic contemplation. Krymov focused his attention on the tone; he said that the essence of painting is not in color, but in the tone that fills color with light. In his work “Summer Day”, the author managed to convey the fascinating silence of a transparent summer day. The picture breathes with warmth, joy, glorifying life in all its manifestations. At first glance, it seems that this composition is absolutely random, as if the moment stopped for a split second. But looking closer, you can see a very soft color and light design of the painting, which immediately brings the viewer to him. For Krymov there was no bad weather, he wrote what he loved from childhood and constantly saw. With heartfelt skill and subtle lyricism, the artist conveys the state of nature. We see a clear sunny day dormant in a hot languor. The river, filled with heat, bushes and trees, is a felt image of nature. 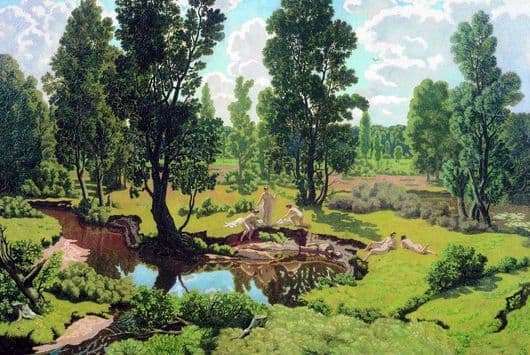 That’s what really strikes in the canvas “Summer Day”, so these are figures of bathers who, perched on the bank of the river, communicate with each other. The depiction of figures is not characteristic of the artist, Krymov preferred to paint urban motifs more, and in his late works, village landscapes prevailed. This was the artistic truth that Krymov created in his canvases.